Having spent a couple of days at the Sustainable Living Festival (with the Perm-apiculture group on the Permaculture Melbourne stand), I've had many conversations with prospective and current beekeepers. The topic of honey extraction has come up a number of times, so I thought I write something on that, while it was fresh in my head. In doing so, also tease apart some of the myths and issues in terms of conventional vs Natural Beekeeping. It seems that the perception of the 'need' to use centrifugal honey extractors is near universal - even among small scale, home beekeepers. No big surprise here, the practices of larger scale or commercial beekeeping have become the de-facto standard for all beekeepers and very few people question the status quo. Still, it amazes me that whenever I mention honey harvesting, the default response is "you'll need an extractor for that". When I question that need, it is met with "oh, but it's so much faster" etc. Me: "I'll take some frames please." Seller: "Great and what type of foundation would you like." Me: None, thanks, I don't use it." Seller: "Oh, so you don't mind getting less honey then." 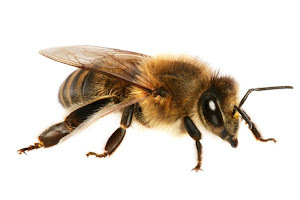 Me - thinking: "Actually, I do not mind 'getting less honey' IF that's what going without foundation means"
Both of these scenarios are related to the same line of thinking - that the ultimate (if not indeed only) outcome of beekeeping is the amount of honey we can gain from a colony of bees. This seems to represent our modern (industrial) mentality of maximising rather than balancing our expectations. OK, so if one is a commercial beekeeper and needs to make a living from beekeeping, then fair enough - of course honey yield is a primary and necessary focus in order for the business to survive. We could have a discussion about ethics and the long terms outcomes for bees in that situation, but that's not our topic here. What is of concern here is that these 'default' positions within beekeeping conversations are passed onto newcomers to backyard beekeeping and are accepted as received wisdom from experts - often then, without question. Of course, I seek to offer an alternative view (use crush and strain) and that's what we've been promoting at the expo. It has been vary satisfying to see the 'light bulb switch on' with so many people, once they've been made aware of this view. The conversations are different each time - but follow similar patterns . . .
1. Why do we use these extractors? The usual response is something along the lines of "because everyone else does" or "the alternatives are too time consuming/slow/troublesome". I agree that, if one has a LOT of frames to FREQUENTLY extract honey from, then yes, the scale of the operation would warrant the use of a $550 extractor. Someone selling honey as a business, for example. Then I'd ask how many frames are being extracted from how many hives and it's typically one or two hives and and 20-40 frames per year. Small scale. 2. How much time is really saved? When we typically think about this question, the consideration is limited to the process of getting the honey out of the combs. We imagine the satisfying speed at which honey is spun against the side of the tank verses watching the drip, drip, drip of straining crushed honey through a sieve. Of course the centrifuge is much faster at this point in the process. But that's not the whole story. 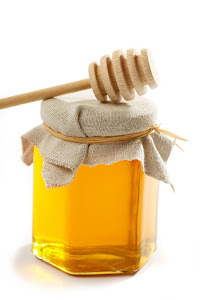 allow the honey to fall through a sieve and into a receiving container. The speed to mostly related to how warm the honey/room is. Bear in mind that you do not stand and wait while it drips - you leave it alone and come back when it's done. I've done some in summer in 90 minutes. at this point you can bottle the raw honey or put it through some finer filtration (muslin) and settlement to remove wax particles and air. Return the bare frames to storage or the hive, adding a fresh starter strip if required. The wax can be pressed and washed and purified as a separate product harvesting process, so let's exclude that part. heat up plain, steam or electric capping tools and use them to slice off the caps from each frame. clean up the equipment - noting that far more and more complex equipment is used and more containers. For example - you might need to take the huge extractor into the shower to get honey out of all of the nooks and crannies! take the stickies, place them in a hive box and place them on top of the hive for the bees to clean. If you are leaving them there for the bees to start reusing the comb, then you are done. If you want to store the frames/combs (say, for winter) then leave them for a day or two and then remove the box and talk precautions against wax moth before you store them. That could be a few days in the freezer and sealing them tight in a bag. The put them somewhere safe for a few months . . . The wiring and foundationing of frames is a tedious, laborious and time consuming job for beekeepers. Granted though that the frames are possibly reused many times, once done. Crush and strain harvesting requires reinstalling starter strips after each use, but that can be avoided by using wooden comb guides instead. 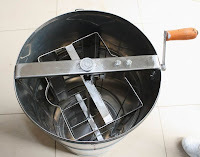 Then there is the purchasing and maintenance of the extractor and all that other equipment and the time you spend at work earning the money to buy it in the first place. I'd suggest the payback on even selling the honey was marginal . . . Why not just allow the bees to produce enough honey for you and to give away to a few friends every year - what 20-30kg at the most? I ask budding beekeepers why they need two colonies in Langstroths to try and produce around 150kg of honey per year and what would they do with all that honey? It can actually become a problem that needs a solution! Time - I think this shows that you do not save time, as a small-time beekeeper, using centrifuges. Honey absorbs water and in doing so begins to 'spoil'. The less exposure the honey has to air and oxygen, the better. OK, some people leave honey draining for days in sieves and that's not ideal. But the essential thing here about extractors is that they can reduce the honey into fine droplets which are flung through the air then slowly run down the large area of the tank sides, taking air bubbles with it. 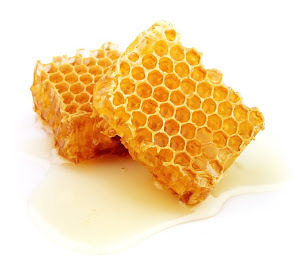 There is some discussion about how much impact this might have on the complex and sensitive components of honey and whether that reduces its overall properties. I think we should end here - but isn't it amazing that by passing on a single piece of conventional wisdom to small scale, new beekeepers, we can lock them into a process which is very possibly counter-productive in almost every aspect? And the opposite of what is 'promised'. Natural beekeeping - use small scale, simple, low cost approaches.